Writer's note: This review is an updated version of my 2016 review of the film's original Blu-ray release. Screenshots are taken from that disc. Leave it to Eli Roth to direct a cannibal horror film three decades after the "cannibal boom" when films like Cannibal Holocaust and Cannibal Ferox shocked grindhouse audiences. His Green Inferno - the title alludes to the recovered footage in Cannibal Holocaust and its more obscure sequel - took two years to reach theaters, due more to its original distributor's financial difficulties than the film's violent content. Roth's movie lacks the grit and terror-inducing realism of classic cannibal terrors, but I did enjoy its schlocky thrills. 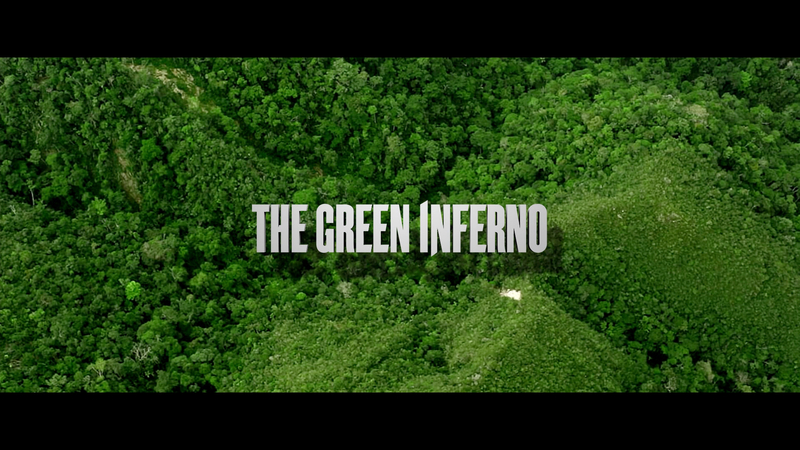 The Green Inferno suffers from Roth's tendency to linger on unnecessary exposition and non-essential characters, and the film blows its load too soon, choosing to depict the most brutal killings early on. Even so, the Peruvian and Chilean backdrops are beautiful on screen, and Lorenza Izzo is a bright-eyed protagonist you can root for. 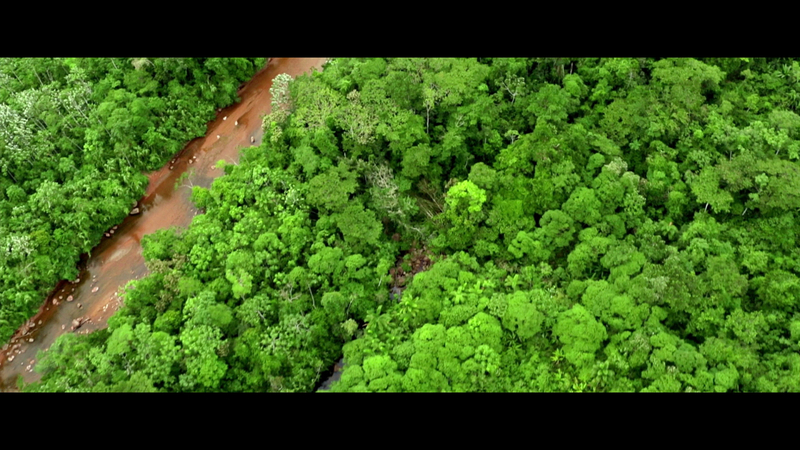 The film opens with two natives stumbling upon a logging operation. Cut to a New York City college, where Justine (Izzo) is a socially conscious freshman and daughter of a United Nations lawyer. She gets invited to join an activist group led by charismatic Alejandro (Ariel Levy), and travels with them to the Amazon rainforest to stage a demonstration against the loggers. Justine quickly realizes she is a pawn and is in way over her head when the group is confronted by gun-toting security agents for the logging company. They escape unharmed, but their plane crashes in the jungle as it climbs toward America. The survivors are captured by a local tribe that begins ritualistically killing and eating members of the group. Roth makes the social activists as annoying as possible during the opening act. During an obvious, conservative-baiting seminar scene, the naive Justine wonders if her father could do something to stop the entire world's atrocities. Lol. Alejandro is a terrible, self-promoting person, and it is revealed that he does not care about the safety of anyone on his team. The demonstration is ill planned and dangerous, and the group gets exactly what is coming to them. Roth seems to want viewers to root against the young characters. Fortunately, Justine gets a quick wake-up call in reality and becomes a halfway-decent (and gorgeous) protagonist. 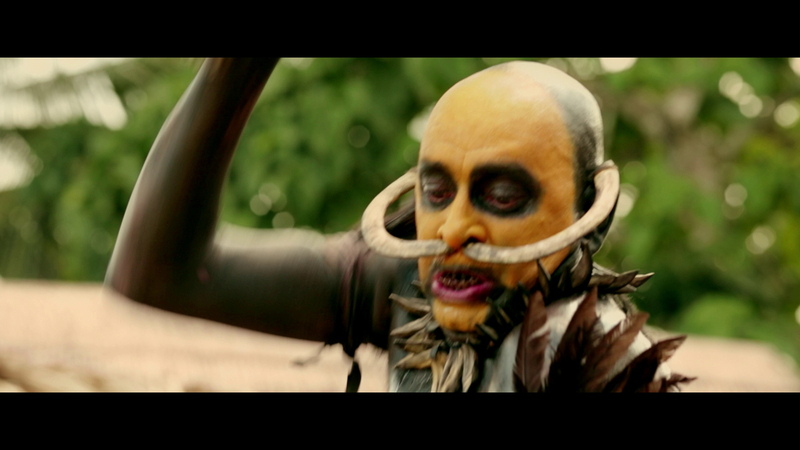 Roth always hurts those that deserve it most, and The Green Inferno has plenty of retribution on tap. The film's biggest problem is pacing. The opening takes forever, and Roth overdoes it trying to convince the audience that some of these characters are going home. Get to the point, buddy. I assumed an early village ritual kill complete with removed eyeballs and limbs would be the start of something even nastier to come, but it was not. Every other kill after this first shocker pales in comparison, and that hurts The Green Inferno. Still, there are some lurid, brutal turns and unexpected carnage, as when a character discovers the origin of her breakfast, but the big, gory sacrifice already numbed the audience. And leave it to Roth to include the most random, irreverent humor. A massive, unexpected bowel evacuation elicits laughs from village children. Later, someone slips weed into the tribe's meal and everyone gets high. OK, that part I liked, and learned in the new bonus material that this idea jumpstarted the film. In my 2016 review I complained about this campy humor, but my opinion has changed since. I now understand what Roth was aiming to do, and appreciate how the sly tone affects the film's overall impact. 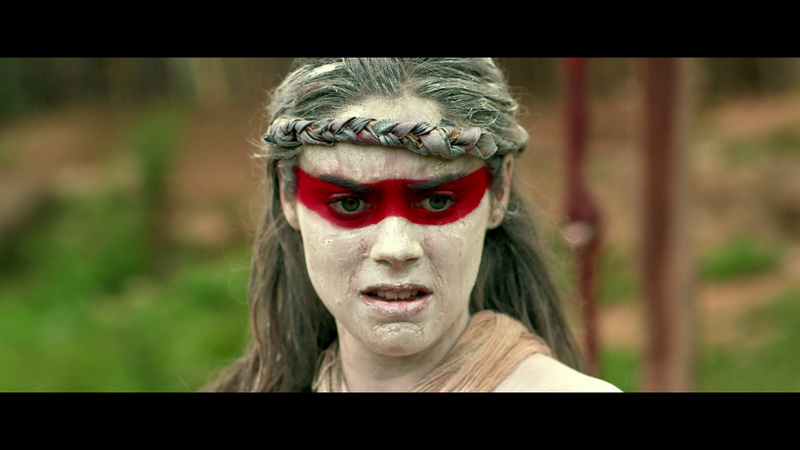 The Green Inferno may be too polished to stand alongside classic cannibal films, but Roth at least provides an entertaining, winking homage to those movies. Shout! recycles the 2.40:1/1080p/AVC-encoded transfer from the Universal Blu-ray, and it pops with lush jungle greens and bloody intestinal reds. The film does sport digital photography, which is somewhat detrimental to the gritty action on screen. A few early shots are a bit soft and blurry, like the overhead view during the opening credits. Things clear up nicely after that, and fine-object detail and texture are abundant. The digital photography causes some minor blurring, noise and purplish blacks, but things are mostly tight and refined. The 5.1 DTS-HD Master Audio mix is nice. The forest environment lends itself to plenty of ambient noise, and the surrounds make full use of effects and dialogue pans. 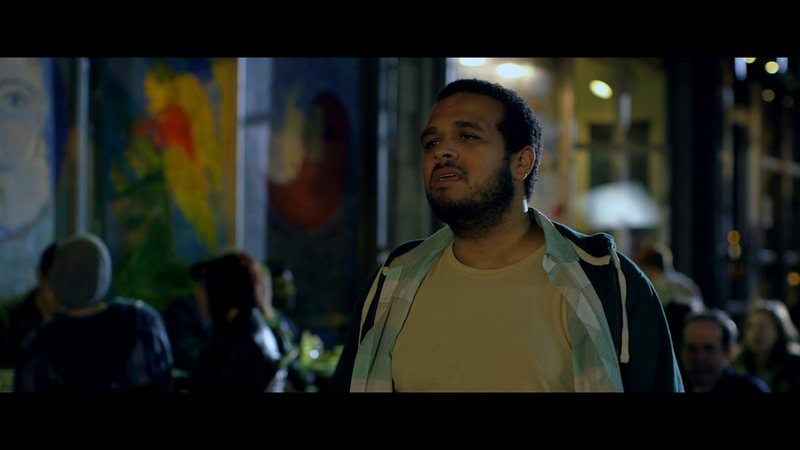 The brutal killings result in rambunctious sound design and frequent LFE rumble, and the score is nicely integrated. English SDH, French and Spanish subtitles are included. This new, two-disc "Collector's Edition" from Shout! Factory subset Scream Factory arrives in a standard case with two-sided artwork. The newly commissioned artwork is duplicated on the slipcover, and fans of the original Blu-ray artwork can find that on the reverse of the key artwork. Disc 1 is the Blu-ray, which includes new bonus materials, and Disc 2 is a 24-track CD soundtrack of Manuel Riveiro's score. Recycled extras include extensive Photo Galleries and a Commentary from Director Eli Roth, Producer Nicolas Lopez and stars Lorenza Izzo, Aaron Burns, Kirby Bliss Blanton and Daryl Sabara. Roth is a good moderator, and each participant actually adds something to the track. There is a lot narrating what is happening on screen, however, and I wish Roth had talked a bit more about his inspirations and future plans. 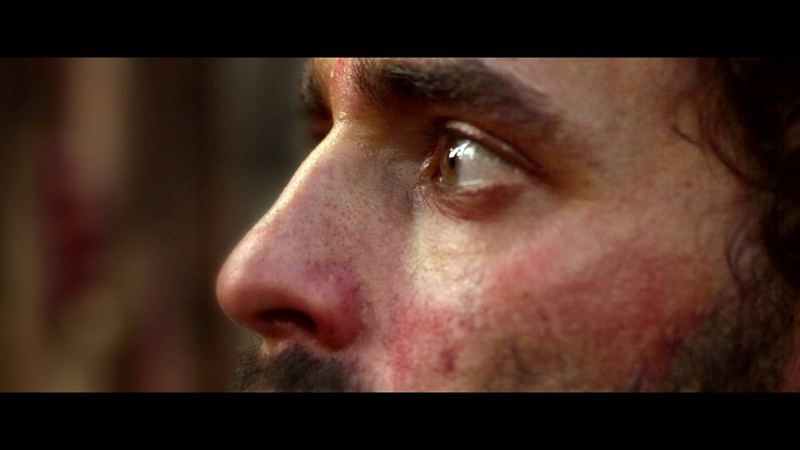 The new material kicks off with Into The Green Inferno - Interview with Director/Producer/Co-Writer Eli Roth (50:26/HD). Wearing a Cannibal Holocaust t-shirt, Roth discusses the entire filmmaking process from the film's genesis (filmmaker Diablo Cody telling him he has to make a movie about cannibals getting high and getting the munchies) to guerrilla location scouting to casting and impact. This is a really enjoyable interview, and Roth proves a good-natured host. 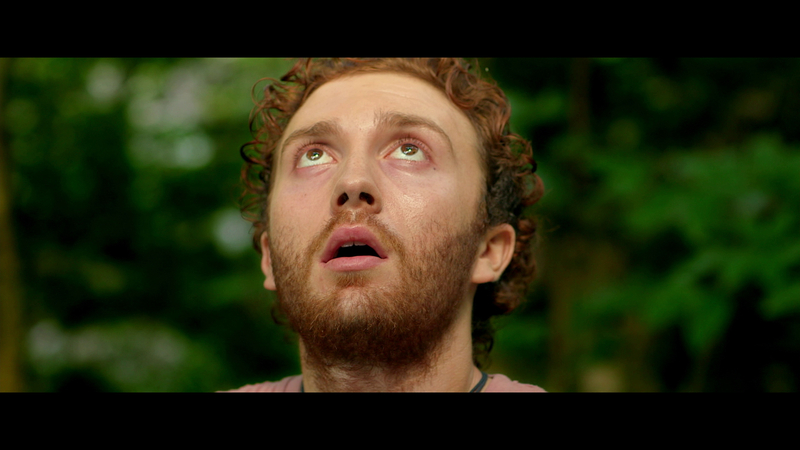 Uncivilized Behavior - Acting in The Green Inferno (34:55/HD) offers interviews with Lorenza Izzo, Daryl Sabara, Aaron Burns and Kirby Bliss Blanton, and, while some of the stories are similar to Roth's, I particularly enjoyed hearing from the charismatic Izzo. You also get a huge chunk of Behind the Scenes Footage (58:31/HD), which offers raw, on-set glimpses of Roth and company at work. Things wrap up with an old but new-to-Blu-ray Making-Of Featurette (15:57/HD); a Lorenza Izzo Featurette (1:15/HD); Meet the Villagers Featurette (1:23/HD); Amazon Jungle Featurette (1:24/HD), the Theatrical Trailer (2:12/HD) and TV Spots (2:10/HD). 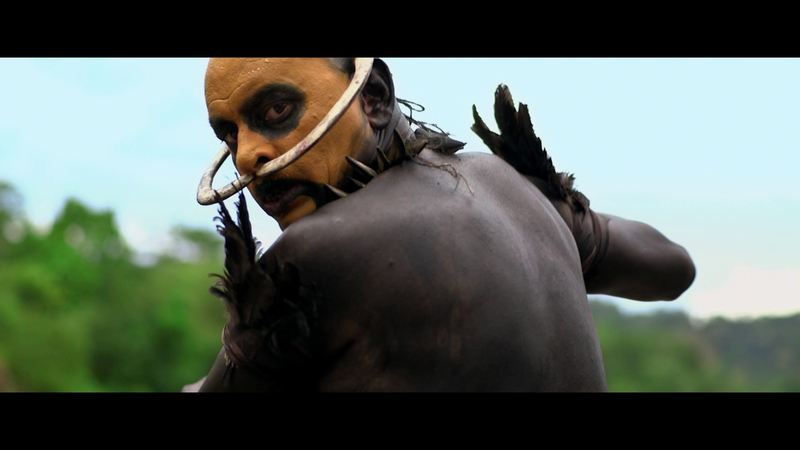 The original delays for The Green Inferno are neither an indication of its quality nor its violent content. Sure, this cannibal thriller is bloody, but it never feels as dangerous as classic films like Cannibal Holocaust. All animals remain unharmed, though the human cast is put through the wringer. I appreciate the campy, winking tone of this film more than I did upon its original release, and Roth's ode to cannibal carnage is a fun ride. Scream Factory's new "Collector's Edition" Blu-ray recycles the competent picture and soundtrack from an earlier release and adds valuable bonus material, bumping up my score from the 2016 Blu-ray. Highly Recommended for fans.